You are here: Home > Blog > Energy, sustainability & economics > How Do You Make Charcoal? 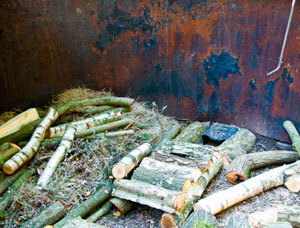 Many people with small woodlands are attracted by the idea of using their wood for charcoal making. You can either allow a charcoal burner to use your woodland for a season or you can try making it yourself. Several people who have bought woodlands from us have successfully made their own charcoal and they have been selling it at woodfairs and other rural events. If you want someone to make charcoal for you, try advertising or make contact with one of the experienced charcoal-makers who work permanently in woodlands. There are about 100 or so charcoal burners in the UK who make charcoal more or less full time. These burners are concentrated around Dorset, Hampshire and Cumbria and the main market for which they make charcoal is the home barbecue market. Typically, full-time charcoal burners have a large, steel kiln which is almost three metres in diameter and a little over a metre in height. This is loaded up with wood, mostly hardwoods such as oak, which have a very slow burn. The kiln is then sealed with a large lid. To make charcoal the burn must be slow and incomplete so that the wood dries out and its structure and capacity for burning remains. This process - converting wood to charcoal - takes about 14-16 hours and produces ready-to-use lumps of charcoal. Blacksmiths who prefer charcoal to coke still use woodland-produced charcoal. Surprisingly perhaps, charcoal is still used industrially for some metallurgical processes and as a filter to remove organic compounds from water and air. Selling to the supermarkets has been a challenge for the charcoal burners, but a group of entrepreneurs at Bioregional Charcoal Company Limited have worked hard to coordinate the marketing of UK-produced charcoal. Locally produced charcoal is now available at B & Q, Sainsbury’s, Tesco and the Co-op. Bioregional now has 25 producers and sells about 300 tonnes per year. Because home- produced charcoal eliminates much of the transport costs; it reduces the carbon emissions from its production by as much as 85%. Many other producers sell direct, through local shops, petrol stations and at summer events. Anne, these are unlikely to be your big ol’ beautiful park oaks, but the branches and smaller oaks, particularly accessible in land being returned to heathland. Oak used to be coppiced, largely because coppiced it would produce a lot of bark, used in the tanning of leather. Sometimes, oaks are just left to grow in the wrong place. But the bulk of straight oak will be sold as timber, such as for floorboards. It would be great if we could coppice oak, for charcoal making, again. Chestnut and hazel seem to be the only ones getting much coppice attention. I cannot believe my eyes that in our very DE-FORESTED land that we are actually turning OAK trees into CHARCOAL and then IMPORTING it fairly UNCHECKED from POLAND etc??? Just how many TREES are left in NAMIBIA which is mostly a GREAT DESERT?? Noted a comment on charcoal burning. We do it for a living near Penrith in Cumbria. We used to provide our local “independent” Co-op with BBQ charcoal. Two years ago they went really “Fair Trade”. This meant they stop taking charcoal made 6 miles down the road in favour of Namibian charcoal, a journey of 5,000 miles, I am sure those who produce it do not benefit financially or in terms of a recourse they need at a local level. If you season hornbeam it will burn brilliantly and produce a lot of heat. If you burn it green it will smoulder and produce almost no heat at all. We would have emailed but could not see an email address. Hornbeam is the best wood that we have found for making charcoal. It is far better than oak.